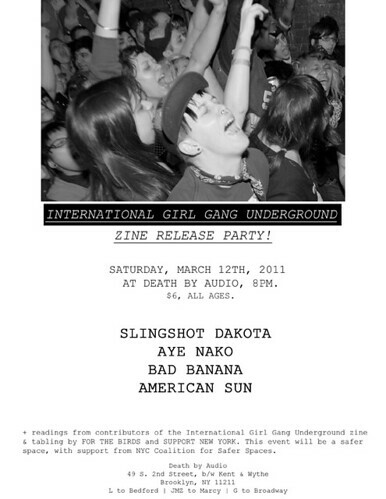 I've curated a zine release party for The International Girl Gang Underground at Death by Audio on March 12th! This is GIRL GANG GIG VOLUME #004. // The International Girl Gang Underground Zine Release Party has a safer space policy intended to make this event a supportive, nonthreatening environment for everyone including survivors of abuse and sexual assault. Harassment, abuse, and assault, as well as racist, sexist, queerphobic, classist, ageist, or otherwise oppressive remarks or behavior will not be tolerated.